As the curtain slowly closes on the summer garden and the autumn garden edges towards its glory, I’d like to offer thanks. No, not a religious thanks for a summer of tomatoes, peppers, cucumbers, okra, and other warm weather vegetables. But thanks to a person, the person who bred Sungold cherry tomato. Anyone who is not familiar with Sungold tomato should be. It’s sweet but not cloying, and has a beautiful persimmon-orange color. I once grew over 20 varieties of cherry tomatoes, including Sungold, for a magazine article. Mostly, the tomatoes were ho-hum, with the exception of Sungold, its hardly known sibling Suncherry, and Gardener’s Delight and Sweet Million. Of the great-tasting lot, Sungold was the best, which is why so many people grow it. With all that beauty and flavor, Sungold is not hard to grow. It starts bearing relatively early each season and bears heavily all season long. As testimonial to Sungold’s flavor and other qualities, it’s sometimes listed along with heirloom varieties. It’s not an heirloom. It is an F1 hybrid variety, which means I can’t save seed myself to plant each year. Not if I want Sungold, as opposed to a tomato that hints of Sungold. Ever since Sungold was introduced, gardeners have been trying to develop an open-pollinated form, that is, one that would be “true” from seed. So who was it that gave us Sungold? The only information I could sleuth out was that Sungold was developed in the 1990s by Japan’s Tokita Seed Company. It seems that the Japanese enjoy sweet tomatoes. It seems that so do many Americans. Too bad about Sungold because saving vegetable and flower seeds provides such primal satisfaction, and saves some money. Every year I save seeds from such vegetables as Shirofuma edamame, Sweet Italia pepper, and Ventura celery. Especially satisfying are the popcorn and polenta seeds I’ve saved over the years. Corn, after all, is a staple, a grain that we can each grow in our own backyards. It’s more suited to backyard production than other grains because its grains (kernels) remain attached in profusion in a neat, husk-wrapped cylinder. That’s perfect as a cultivated grain for us humans for easily gathering at the end of the season although not so good for a wild grain because they are poorly dispersed. Corn’s ancestor, teosinte, which originated in Mexico, was a better wild plant, with each primitive ear hosting just a few kernels that had plenty of elbow room to grow once they dropped to the ground and sprouted. Popcorn is also especially satisfying because it’s a fun food. Today I harvested two beds of Dutch Butter popcorn and one bed of Pink Pearl popcorn. These two varieties, in my opinion, taste better than commercial varieties I’ve tasted even if they don’t puff up as large when popped. The white or pink ears also look very pretty hanging all winter from a rafter in the kitchen. I started growing and saving polenta corn seeds a few years ago after being given a couple of mature ears of Otto File, an heirloom Italian variety whose name translates to “eight row,” which it has. The kernels have an orange tinge and, once ground — especially if ground fresh — cook up into a delectable polenta of distinctive flavor. This variety was almost lost, and I was given it as part of an effort to maintain it. The one problem with growing popcorn and polenta corn is that each variety has to be sufficiently isolated so that no cross-pollination occurs. They also have to be isolated from sweet corn, which I also grow. So I planted sweet corn in my north vegetable garden, and clumps of Otto File in the south field between the dwarf apple trees. The two popcorn varieties go into the south vegetable garden. Evidently, they were not sufficiently isolated because Dutch Butter sometimes has some pink kernels and Pink Pearl sometimes has some white kernels. Even the mutts — Pink Dutch Pearl Butter? — taste very good. I must mention Lee. No, not me, but the recent tropical storm that followed on the heels of hurricane Irene. Tropical Storm Lee brought a surprising amount of water so that extensive flooding again occurred, the second worst I’ve ever seen. A prominent legacy in these days following the storm are mosquitoes, hordes of them. It is almost impossible — no, it is impossible — to go outdoors unprotected. I’m relying on my mesh Bug Baffler and, to a lesser extent, the effective deet alternatives picaridin (found in Natrapel) and lemon eucalyptus. I’m hoping that the abundance of mosquitoes will build up populations of their predators so that next year will bring even fewer mosquitoes than usual. Bats and purple martins, contrary to popular lore, are not particularly effective at reducing mosquito populations. Most effective are dragonflies as well as some other insects (including the larvae of some species of mosquitoes! ), small crustaceans, and fish. Mosquitoes can also be controlled by treating their watery breeding grounds with the bacteria Bacillus thurengiensis var. israelensis or B. sphaericus, both of which are relatively nontoxic to everything except mosquito larvae. As natural waters recede, draining containers and other open sources of water will also limit mosquito numbers. A couple of frosts or a heavy frost, to 28°F. will do in some mosquitoes (Aedes). But for all the beauty and abundance of the autumn garden. could I really hope for that which would put a quick end to summer’s vegetables? Sungolds! Yes, indeed. We grew two of them — one at the east and one at the west ends of a 16 X 4′ weedless (thanks to you!) bed. They were, as you say, very prolific. They were also…THUGS! One stretched out eight feet into the middle of the bed! Totally drowned out a poor Kelloggs Breakfast next to it. I will admit we were away during some crucial pruning times, and did get a bit too attached to our huge plants. 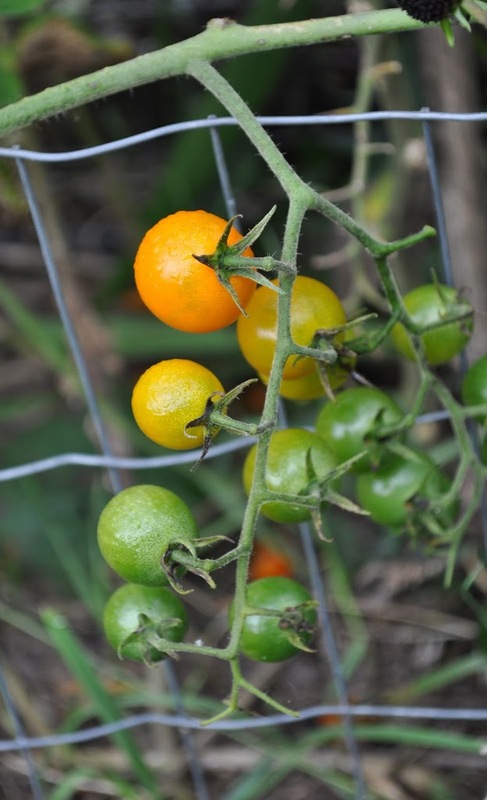 We broke a few other tomato growing rules as well, but the Sungolds were definitely the champs in the production department. Very popular as giveaways as well. I’ll be blogging about the fall cleanup and will definitely be sending you a shout-out. Your weedless techniques worked like a charm and made our brand-new beds much more fun to work with (I weeded all 4 16′ beds only once!). For now, I’m not sure where you can get it. How much do you need? If only a packet’s worth, contact me and I’ll send you some with which to start building up your own stock. That would be great. I’d be happy to pay for a starter packet. It seems like most packets have a hundred seeds so if you could spare that many that would be great. If you can spare more, all the better. Let me know how much and what price! Do you have paypal? I’m not in the seed business. Get me your address in some way and I’ll just send you some seeds. You can contact me through my website, listed up above and to the right.